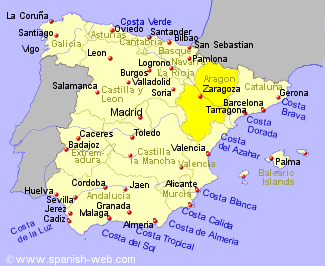 Aragon which comprises the provinces of Huesca, Teruel and Zaragoza, is famous for its Morcilla, black pudding or blood sausage, which includes both rice and pine nuts. Aragonese garlic soup is popular made with almonds and eggs. Another is flavoured with tomato, pepper, and chorizo to which bread is added and then browned in the oven. Lamb, roasted, is eaten here a lot, also many different stews. Ham and sausages cured, and the most famous dish, lamb or chicken braised with tomatoes and peppers and garnished with sweet red pepper called Chilindron. Fresh trout, crayfish, eels and cod are served in many different ways. A famous dish is Bacalao al Ajoarriero, which is salt cod flavoured with garlic, parsley and dried red peppers. There are also vegetable gardens and fruit orchards where you will find apples, cherries, peaches and melons. Desserts are well spiced and for festive occasions candied fruits and and Marzipan are served.